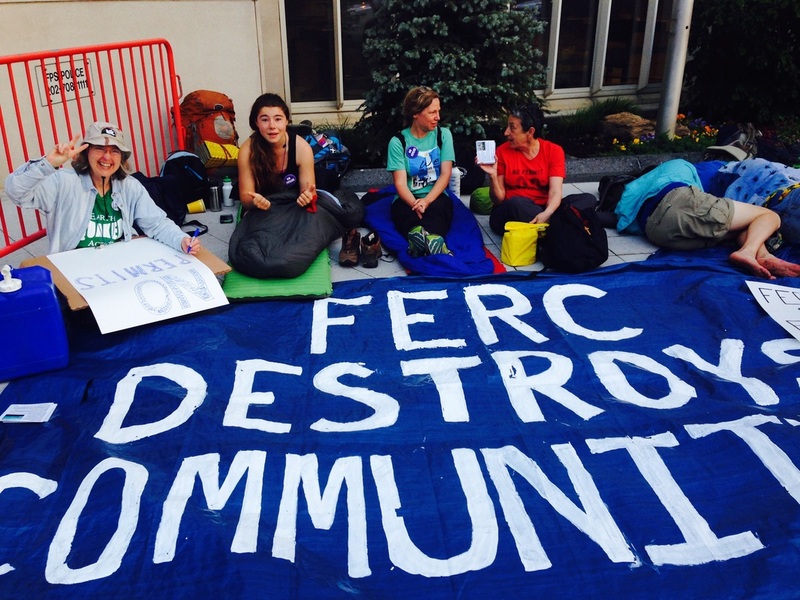 Just got back from Stop the FERCus!, a week-long series of actions mostly in front of FERC, the Federal Energy Regulatory Commission, in D.C., organized by Beyond Extreme Energy, or BXE. We want FERC to stop approving all the fracked gas infrastructure that allows the unending expansion of fracking, and to move to supporting truly clean energy.There were amazing blockades using people, banners, a metal tripod 20 feet high from which a woman was suspended, and other creative paraphernalia. This action differed from the week we did at FERC last November in that we had many more people here for just a day or two, rather than a full week, so it seemed less cohesive, but it was also good that folks were there representing anti-pipeline, anti-gas export terminals and anti-stinky, polluting compressor stations (to move the gas through the pipelines) all over the East.